I love fall vegetables. A lot. So when I came across this recipe for a warm salad (warm!) with chickpeas, butternut squash, and tahini dressing, I was pretty much instantly sold. It’s lovely as soon as it’s done, and it’s still lovely zapped in the microwave for lunch a day or two later. Preheat the oven to 425 F. Peel the squash, then slice it in half and scoop out the seeds. Chop it into cubes that are about 3/4 of an inch across. It’s a good idea to keep the size as uniform as you can here — otherwise the little chunks dissolve into mush before the big ones are cooked through! In a big bowl, combine the squash, garlic, allspice, olive oil, and a good pinch or two of salt. 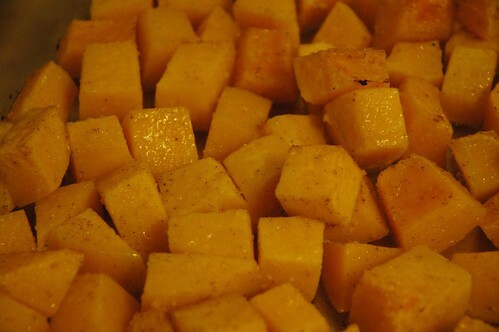 Toss with a spoon or your hands until the squash pieces are evenly coated. Turn them out into a rimmed baking sheet or pan, spreading into a single layer. (Mine all fit in a 9×13 baking dish, but it’s fine to use two pans if needed.) Bake for 20ish minutes, stirring once halfway through, until it’s easy to get a toothpick all the way through the squash pieces. *I use the stuff in a jar from Trader Joe’s all the time — not to be confused with the chopped garlic you can get at the grocery store, which is horrible! — but you can also put fresh garlic through a press.